CRIMINAL MISCHIEF – On September 30, 2015 at 9:16am, Patrolman Phil Schena was dispatched to the Birch and Surf Park area to meet with personnel from the Department of Public Works. Upon the officers arrival, he was advised that someone had damaged the basketball rim at the park. Public works personnel were going to replace the rim but wanted it documented. They were unsure of when or how the damage occurred. WARRANT ARREST – On October 04, 2015 at 3:53am, Patrolman Dennis Allen conducted a motor vehicle stop in the area of Bowline Street and Surf Avenue. Upon checking the drivers credentials, it was learned that the driver of the vehicle, James Keown, 28 of Lacey, had an outstanding warrant from South Toms River. The driver was arrested and turned over to South Toms River Police. DWI – On October 05, 2015 at 1:41am, Patrolman Dennis Allen conducted a motor vehicle stop in the area of Atlantic City Boulevard and Spar Avenue. 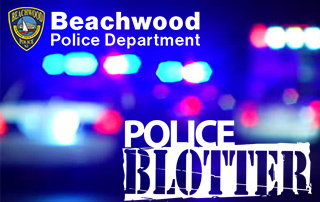 As a result of the stop and the officers investigation, the driver, Richard Thomas, 45 of Beachwood, was arrested and charged with driving while intoxicated. The driver was transported to Beachwood Police Headquarters where he was processed and released to a family member. The charges are pending a court date. THEFT – On October 05, 2015 at 4:00pm, Patrolman Chad Anthony took a report from a female reporting that her pocketbook may have been stolen. The female reported that on Oct. 01, 2015 she was at 501 Atlantic City Boulevard and upon returning to her vehicle she was unable to locate her pocketbook. She was unsure if it was taken into the business or left in the vehicle. THEFT – On October 06, 2015 at 9:03am, Patrolman Phil Schena was dispatched to a residence on the 1500 block of Ocean Avenue for a theft report. The caller reported that a spare tire rim was taken from the bed of a pick up truck sometime during the overnight hours. The tire and rim were valued at approximately $200.00. THEFT – On October 08, 2015 at 8:15am, Sergeant Frank Melillo responded to a residence on Locker Street for a theft report. The caller stated that her husbands wallet from taken from his vehicle sometime between 6:00pm on Oct. 07 and 4:45am on Oct. 08. The vehicle was parked in the driveway and unlocked at the time. THEFT – On October 09, 2015 at 4:47 pm, Officer Gina Bruno responded to the Welsh Farms at 315 Atlantic City Boulevard for a theft report. Upon her arrival a store employee stated that a male asked for a pack of cigarettes and left without paying for them. CRIMINAL MISCHIEF – On October 10, 2015 at 10:23pm, Officer Gina Bruno was dispatched to a residence on the 1300 block of Anchor Avenue for a report of pumpkins that were taken and damaged. The caller reported that a juvenile took the pumpkins off his front porch and ran. He attempted to locate the juvenile but was unable to do so. Officers checked the area as well. THEFT – On October 13, 2015 at 7:08 am, Patrolman Chad Anthony was dispatched to Java Joe’s located on the 200 block of Atlantic City Boulevard for a theft report. Upon the officers arrival, the owner advised that money was taken from the business sometime between 3:30pm on October 12 and 7:00am on October 13. The business was not open during those times and there were no signs of forced entry to the business. The incident is currently being investigated by Detective Adam Griesemer. Anyone with information is asked to contact the detective at 732-286-6000 ext. 191.